This time the spotlight will be shining on Guppy, an aquatic survival game in which you get to play as… wait for it… a fish! Quite the agile little fella too. So, what say we help it escape the cold emptiness of Greenlight limbo, eh? Guppy is a 2D watercolor fish simulation that tries to replicate the way fish propel themselves through the water, moving their tail left and right. Venture carefully into the open in search of food, hide in the shade of lilies to avoid predators and swim with friendly schools of fish. Try not to get eaten. Staying alive in this game is simple enough, albeit only in theory. Flippin’ your fins will only get you so far after all, and without proper nutrition (ie. 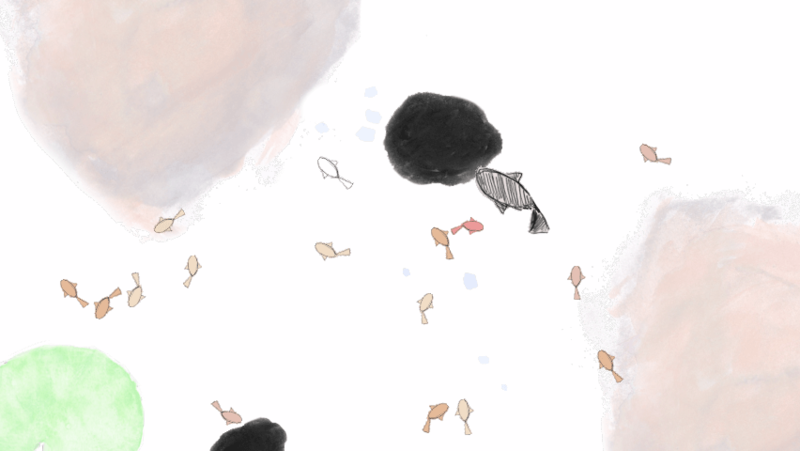 flies), you won’t have anything even resembling a high score (the goal in Guppy, in case you were wondering). Oh and do watch out for aquatic predators, as they can be quite troublesome. Could always hide under a lily pad though, as for some reason, that makes you almost completely invisible to those bastards. But sooner or later they will get ya, so better make the most of your time. Go splish, go splash, gobble up as many flies as possible for bragging rights, and… enjoy your new life as a guppy, however temporary. So riddle me this, dear reader: why is Guppy still struggling to get through Greenlight? It’s been out for a while, after all. As such, how about visiting its Greenlight page and handing over a ‘yes’, if you like what you see? Remember: your vote matters!